My hubby Dan is going to help me write some posts from now on - here is his first review!!!! I really love a good burger (who doesn’t?!). Recently, a friend of mine began ranking all of the local burger places in order to come up with his top-5 burgers. 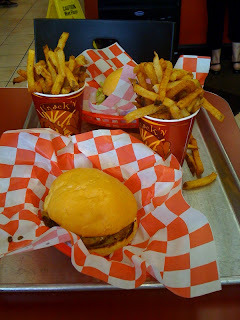 The list included some of the great burger places like Abbey Burger Bistro and Fatburger. But his FAVORITE burger in the Baltimore area was from a place called Burger Brothers in Towson, MD. I had seen and passed by this place many times while walking around Towson looking for a place to eat, but I had never eaten there or even walked in to check out the menu. But because I agreed with the rest of his list, I figured I had better go with him next time to give it a try. Burger Brothers is located on a side street right off of the Towson traffic circle. The location is very good; within easy walking distance of Towson Town Center, and all of the other shops and restaurants in the central Towson area. Although a bit of a walk, the restaurant is less than a half mile away from the Towson University campus, so I imagine that they get a large amount of their business from students. We were there at a very random time (3pm on a Saturday), and it is currently Summer break, so there wasn’t a student in site. The restaurant is located in a standard “strip mall” style building; exactly what you would expect for a burger place, really. It is located right next to Towson Hot Bagels, another place that I have been meaning to try because I hear their breakfast sandwiches are excellent. There seems to be plenty of seating inside, and also a few tables out front to sit at for those who prefer sidewalk dining. Not much to speak of here; there is a counter set up where you place your order like any other burger place/fast food restaurant. The guy who helped us was very friendly. Granted, we were the only two people in the place at the time, but he stood by the counter as soon as we entered, and was ready to help us as soon as we figured out our order. I did happen to glance at a few framed reviews hanging on their wall, and noticed that the guy behind the counter was the same guy pictured in the reviews. This leads me to believe that he was the owner of the restaurant, which I really liked to see; he also assisted in the preparation of our food. And now the important question; how is the food?! They have a surprisingly large menu, larger than what I was expecting. They have much more than just burgers. They have wings, chicken fingers, and a whole assortment of other delicious fried items. But even along the lines of their burgers, they offer chicken burgers, turkey burgers, and even veggie burgers for customers who aren’t in the mood for red meat. But I was in there for red meat, and red meat did I receive! I ordered the standard burger, topped with just cheddar cheese and bacon, and specified that I would like it cooked medium. I usually prefer a medium-rare burger, but I will go with medium during my first trip to a new burger place just in case our definitions of medium-rare don’t match up; I’d rather have it slightly overdone than slightly undercooked! Burger Brothers makes their burgers fresh every day from ground beef; there is nothing frozen or prepackaged about these burgers. And they are BIG burgers, they say they are 6oz burgers but they look to me like they are half-pound. I also decided to partake in a small order of their fresh-cut Idaho spuds (they call them spuds, not fries, to make sure the point gets across). The food took about 5 minutes to prepare, as it is cooked fresh upon being ordered, and the fries are not kept warm in a warming tray, they are also prepared fresh upon order. My burger was absolutely delicious! It was enormous, significantly larger than I was expecting. My one complaint is that I think it was done slightly past medium, although this didn’t stop me from completely enjoying it. The burger was still juicy, the bacon was thick and perfectly cooked, and the burger bun was warm and soft. I have to say, I think their buns are probably my favorite out of any local burger place. The French fries were excellent as well; they are basically Boardwalk-style fries, thick and fresh, and tasted even better with a little Old Bay and Vinegar added! I liked that the fries were not overly salted, allowing me to salt/spice them exactly to my taste. I got the medium order of fries ($2.79), and it was an INSANE amount of fries. Between my burger and fries, I was so full from eating at 3pm that I ended up skipping dinner that night; it never even occurred to me that I forgot to eat dinner until I was about to get into bed. This is definitely a great place to visit if you are feeling particularly hungry, as you will most certainly leave satisfied. I ended up being very satisfied with my entire order. At $5.99 for my Bacon Cheeseburger ($4.99 without the bacon or cheese), they are slightly higher in price than most fast food places, but the fresh quality of the meat and bun was WELL above what you could ever expect to receive from a fast-food chain. They are offering restaurant-quality burgers at half of the restaurant price, and because of this, I would definitely say that Burger Brothers is a GREAT deal. So overall, how would I rank the Burger at Burger Brothers? VERY high. Definitely the best burger I have had in the Towson area, and it is right up there with Fatburger and Boardwalk Fries for being one of my favorite fast food burgers ever. I can only imagine how much better it will be next time I head back and order it medium-rare, now that they have earned my trust! I like Burger Bros. I've eaten there a few times and always leave happy!